The best soccer cleats won’t make you a better player, but they sure can help! Whether you are a goalie, defensive player or midfielder having the coolest soccer cleats is extremely important to maximize your potential and win the game. 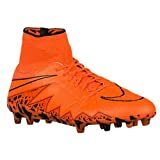 There are some things to keep in mind when purchasing soccer cleats such as the speed, technique and accuracy of the boot. Not crazy expensive – but great! Spending more money on soccer cleats can be an excellent investment if you want to wear the same cleats as professional players and have some amazing features on your feet. Some of the top brands to consider are Nike and Asics. Nike offers a wide selection of soccer cleats at the elite level with a variety of features and in multiple colors. Some of Nike’s best soccer cleat types are the Hypervenom cleat and Magista cleat, as well as the Mercurial. The Nike Hypervenom is meant to enhance player’s agility with amazing features that create a light feel and really support the foot. One important highlight of the Hypervenom series is the option to purchase boots for specific playing fields such as indoor or turf. One of the most distinguishing features of the Mercurial cleats is a carbon fiber plate that is best for those players looking to increase their speed and traction. The Magista cleat wraps around the ankle to protect the foot, but still improves the player’s strength and movement. This cleat is made of the unique Nike flyknit fabric which creates a light feel and improves traction. Nike Hypervenom Phantom II – The Men’s Nike Hypervenom Soccer Cleats are ideal for goal scoring players such as forwards and wingers, but defenders will want to consider a different cleat type. The shoes are lightweight and improve a player’s agility and ball control and were designed for a quick direction change and a firm ground field. Additional features of these synthetic and mesh shoes are the fitted ankle collar, the 3-D upper and the split toe plate that improves traction and performance. Nike Hypervenom Phantom II Leather – The Nike Men’s Hypervenom Phantom II Leather FG Soccer Cleats are made of synthetic and leather and meant for firm, natural playing surfaces. The leather upper is perfect for ball control and touch, while the collar and Flywire cables give the shoe an ideal, protective fit. These cleats contain all conditions control technology so they are durable in both wet and dry settings and the cushioning provides comfort and optimum fit. These cleats are sure to improve player’s agility and ball control during game time. Nike Mercurial Superfly – The Nike Mercurial Superfly CR is ideal for those players looking to increase their speed on the field and be the next Christiano Ronaldo. Designed with Ronaldo’s skill set in mind, these cleats have amazing features such as Flyknit, Nikeskin and all conditions control to ensure optimum performance in all weather conditions on short grass fields. Some distinguishing features of the Mercurial Superfly cleats are the Vapor traction pattern which improves and increases acceleration and a carbon fiber plate that is lightweight to enhance the player’s speed. This model contains a dynamic fit collar to keep the foot in place but still gives the foot room to stretch and breathe. Nike Magistra – The Nike Men’s Magista Obra Leather FG Firm Ground Soccer shoes are made of synthetic and leather materials and come with the Authentic Nike Gear guarantee. These shoes are made for firm ground playing and have various features to increase touch and traction. 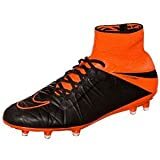 These comfortable cleats have a dynamic fit collar with a leather upper and a stud pattern that increases traction especially if the player needs to rotate or change direction. These Magista cleats offer a perfect fit for every part of the foot with a sock liner inside. Asics Light X-Fly – Another elite brand option for players to consider is Asics and the Asics Men’s DS Light X-Fly Le Soccer shoe stands out from the rest. This particular cleat has features such as kangaroo leather, a PU sole and an X-fly cheat plate made from Solyte polymer that distributes the pressure evenly. The kangaroo leather creates durability and an amazing fit for better control over the ball, while the Solyte polymer gives these cleats excellent traction in any condition and field type. The X-Fly Le Soccer cleats are part of the Asics DS Light series and are offered in multiple sizes at varying prices. There are many things buyers must consider when choosing the right soccer cleats especially at the elite level where the shoes are more expensive. Some consumers should keep in mind when trying to find the best cleats for soccer are the player’s position, the type of playing ground and the materials that are in the upper. 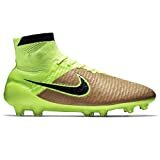 Other things to keep in mind when looking for the coolest soccer cleats are the cost of the shoe and the boot category. Depending on the player’s position and style, some cleats will be more beneficial than others. A goalkeeper requires a shoe that enhances traction and quick movement, while a winger should look for cleats that are lightweight and promote acceleration. Midfielders should prioritize comfort as they spend a lot of time running on the field and defensive players need a shoe that offers optimum protection. Players might have a game in a variety of settings and it is important to have the shoe type that accurately correlates with the field type. Firm ground boots are ideal for natural grass and are often acceptable for artificial ground, while hard ground is best for those who play on surfaces that are dry and bare. Turf cleats are perfect for players running on artificial pitches because of the style and configuration of the rubber studs and indoor cleats are necessary for those playing on a court. Materials in the upper may range from natural leather to kangaroo and synthetic leather, as well as mesh. Kangaroo leather is particularly effective in molding to the feet of the player and providing durability. Synthetic leather cleats are becoming more popular. This entry was posted on February 7, 2016 by admin.